Do you love cheese-smothered veggies? And do you dig mac and cheese? 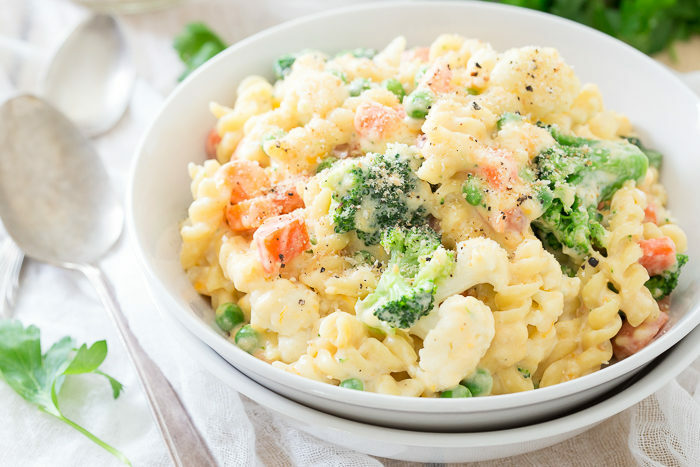 Then this creamy, cheesy, veggie-packed mac and cheese recipe is for you. 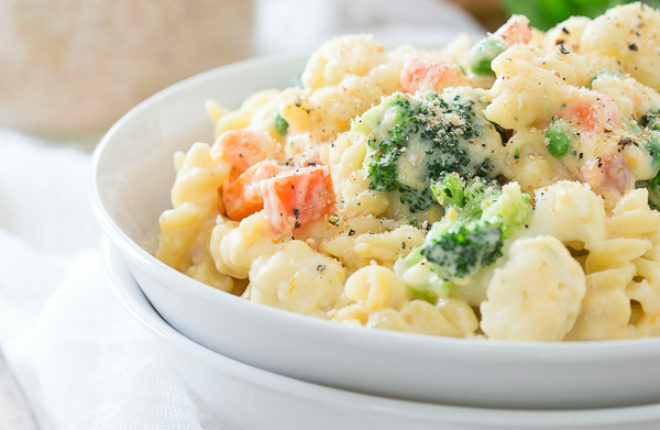 Broccoli, cauliflower, peas, and carrots join up with whole-wheat pasta plus three cheeses for comfort food with a veg-heavy twist. Recipe by Gina Matsoukas of Running to the Kitchen. I married a first-generation Greek. His go to comfort meal is “pita” (basically Spanikopita and every other variation of it) that his mom would make from scratch every week, not a simple thing like American meatloaf or some creamy casserole. Despite the fact that I love being in the kitchen and cooking, made-from-scratch phyllo dough and Greek dishes that try and compete with my mother-in-law’s are just not something I’m willing to do. So for (almost) 10 years now, when I want to make a dinner I know he’ll love, my go-to is mac and cheese, the one “true” American meal he actually likes. Here’s the thing about mac and cheese though; it tends to leave your kitchen a complete disaster zone. Pots, pans, strainers and graters everywhere. Sticky melted cheese and milk situations congealing on things and almost too much clean up to make the meal even worthwhile…almost. I mean, I love my husband but sometimes that’s just more than I’m willing to deal with for a comforting dinner. I’ve often thought about making it a one-pot meal but never could really figure out how to do so. Then it came to me, cook the pasta IN the milk. OMG, you guys, this is life changing. This Veggie Lovers’ Stovetop Mac & Cheese recipe is literally a one-pot meal. No roux needed and not even a colander in sight. If you have leftover cooked vegetables on hand, even better, just throw them in. If not, a simple quick steam (I used the microwave for convenience) is all you need. One word of caution though, this is definitely a time sensitive recipe so have all your prep work done before starting and make sure the cheese is grated and ready to go. The last thing you want is your pasta and milk sitting there waiting for you to grate cheese getting all weird in the pot. 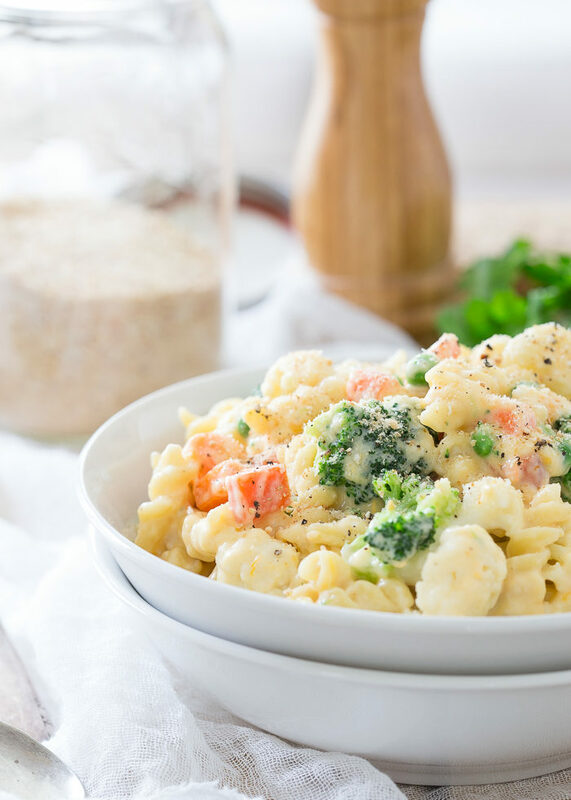 This mac and cheese is so creamy, cheesy and decadent even meat-and-potatoes types won’t care that it’s loaded up with veggies. Although, a little sprinkling of crispy chopped bacon on top wouldn’t be the worst idea in the world if that’s your thing. Steam the veggies. Fill a large pot with about 1 inch of water. Set a vegetable steamer inside and set over high heat. Place the veggies on the steamer. (If you don’t have a vegetable steamer, just place the vegetables directly in the water). Cook, covered, until the vegetables are lightly tender, 2-3 minutes. Remove from heat and drain in a colander. Set aside. You can also steam the veggies in the microwave by adding them to a microwave-safe bowl along with about 1/4 cup of water. Top with a microwave-safe plate and cook on high for about 3 minutes, until the veggies are tender. Be careful when removing the plate – lots of steam will escape! Make the mac and cheese. (Note: Have all of your cheeses grated and ready at this point!) Place the milk, pasta and seasonings in a medium stock pot (you’ll want a pot with high sides because you’ll be adding everything to this pot later) over medium-low heat. Stirring often so pasta doesn’t stick, cook until pasta is al dente (time will vary by brand/shape) and milk starts to thicken. Remove the pot from heat. Slowly sprinkle in the grated cheese, stirring constantly, until melted. Add the vegetables and stir gently until everything is well combined and coated in the milk and cheese sauce. Season to taste with more salt and pepper, if desired. Serve. Spoon into bowls and top with a sprinkling of breadcrumbs and/or red pepper flakes. Top individual servings with cooked, chopped bacon. The Best Macaroni & Cheese Recipe Ever – THE most popular recipe on Kitchen Treaty (for a reason)! Super Creamy Vegan Stovetop Mac & “Cheese” – proof positive that, surprisingly, you don’t actually need cheese to get a super-satisfying mac! 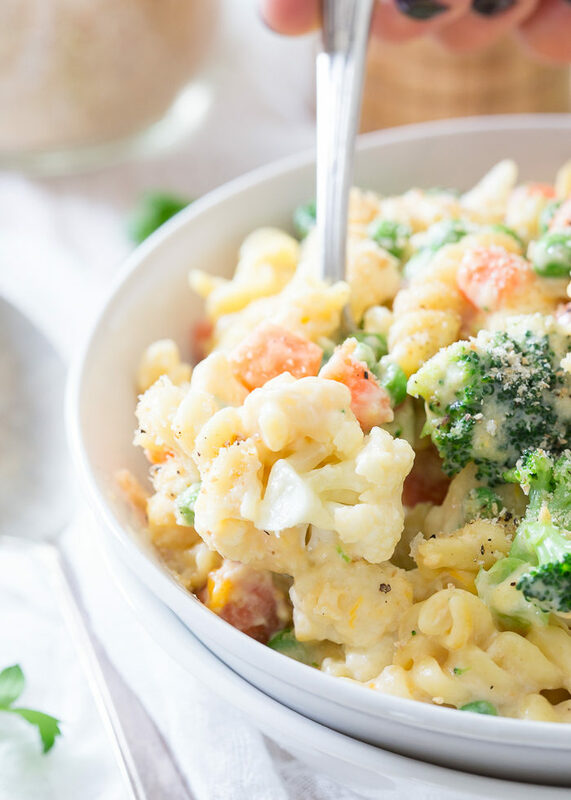 This Veggie Lovers’ Stovetop Mac & Cheese sounds and looks so Delicious!! Thanks for this recipe 🙂 Do you think I’d ruin it if I were to use 1% Milk in lieu of Whole Milk? Hi Elizabeth, I do think that 1% milk would work, but the end result might not be as thick, rich, and creamy. If you try it please report back on how it works out! So this is unusual but I’ll have to give it a try. I’ve made your traditional mac-and-cheese recipe numerous times and it’s always a winner! This sounds really interesting but it seems to me a little light on pasta in ratio to the vegetables and cheese. Is that a conscious (health) choice? Would increasing both the pasta and the milk work? Thanks! The pasta can really soak in the sauce – I’m always surprised how much sauce it takes! 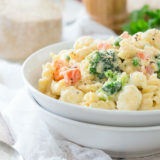 As far as the veggies, go, yes, it is packed with veggies on purpose – you can certainly lighten up on the veggies but I wouldn’t recommend changing the quantity of the pasta or the milk.